Put rice flour in a bowl and add warm water. Mix well and knead dough. Using a teaspoon, roll balls of the mixture into small rounds about 1 inch in diameter. Drop rice balls into a pot of boiling water and boil for about fifteen minutes. Carefully remove dumplings from boiling water, leave to cool on paper towel. Once cool, thread about 3-4 dumplings onto a bamboo skewer and repeat until all dumplings are skewered. Combine water, sugar, and soy sauce in a pan over medium heat. Bring to the boil and slowly add flour and mix quickly. 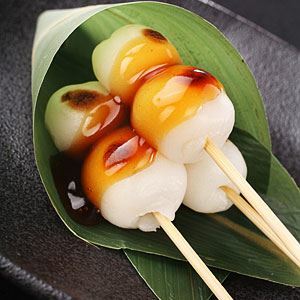 Pour Shoyu sauce generously over Dango on skewers and let it sit for 20 minutes before consuming.